Frame Kits are a very affordable way to start custom framing your art work, you can get a custom frame for a fraction of the price. These durable anodized aluminum moldings are the same quality utilized by custom picture framers and are easy to assemble. 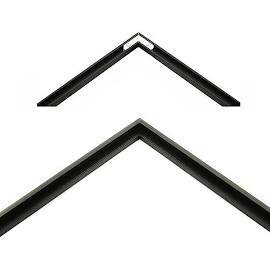 They are a fun DIY project, or our team of friendly framers can easily assemble them for you. You can frame artwork, photographs, and more to any full inch size from 8” to 40”. Each package contains two sections of the same length, and you will need 2 kits to assemble a rectangular frame. glazing, and up to two mats, one of which acts as the backing. behind the beveled front face. You'll need to provide two mats, glass or glazing material, picture wire, and backing paper (to protect the mat) if desired. 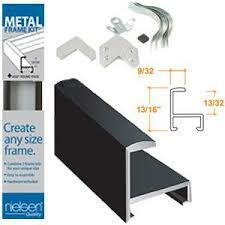 We offer a large selection of metal section frame kits in durable anodized colors. Hardware--corner angles, eyelet hanger, and spring clips--included. *Available in sizes: 8 in. through 40 in.